How would you expect academics to respond to the suggestion to be less academic? Last week Andy Revkin posted this Skype interview with me on his NY Times blog Dot Earth. 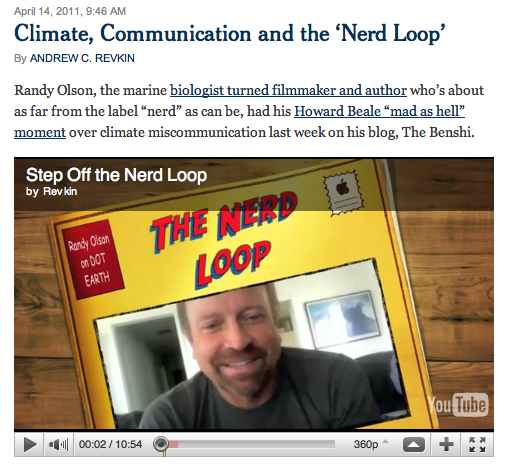 Andy Revkin further explored my “Nerd Loop” essay which spawned a whole bunch of blog discussions from Keith Kloor’s communications oriented discussion titled, “The Painful Truth,” to the climate skeptic blog, Climate Audit, where their title is, “The Smug Loop.” It’s funny how many of the comments equate the idea of improving communication with “propaganda.” You’d think they would be supportive of any efforts (on either side) to make the subject less boring to the general public. One thing is clear, polls show a declining interest in climate lately.